Prepping the apples: Slice an apple using a mandoline slicer (preferred method) or a knife, making slices about 1/8 of an inch thick. Remove seeds and stems from middle slices. Toss apple slices in a bowl with cinnamon and oil. I prefer to add the cinnamon in small dashes to get some on every apple slice, instead of dumping it all on one apple. In the same way, I prefer to spray the oil lightly over the top, stir, and then give another light spray to try and disperse the oil evenly. Preheat your air fryer for about 2 minutes at 300F. Drying the chips: Place all the apple slices into the air fryer basket. Cook at 300F for 20-25 minutes, flipping and rotating apples every 5 minutes. Make sure slices in the middle of the pile are rotated out and all slices are exposed to the hot air at some point. Continue cooking at this temperature until the apples appear completely dried out, with no more shiny or “wet” spots remaining. The edges of the chips will begin to shrivel. If your chips are burning at all during this drying phase, lower the temperature of the air fryer by 25 degrees F.
Crisping the chips: Once the apple slices appear completely dry, increase the air fryer temperature to 325F. Check, flip and shake the apple chips every 90 seconds to 2 minutes. Chips will take 4-8 minutes total to crisp up, depending on thickness and amount. (If they’re cooking too slowly, up the temp by 10 degrees. If they’re cooking too quickly, lower the temp by 10 degrees.) The chips will begin to fly around the inside of the air fryer during this phase. They will begin to curl and gain color quickly. Remove any chips that are browning quicker than others. Let the chips cool for at least 5 minutes and then enjoy! 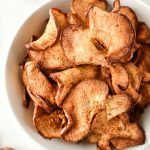 For maximum crispiness, enjoy the apple chips 10-20 minutes after they come out of the air fryer. They will last up to 5 days in a container at room temperature but will become soft overnight. For more intense apple pie flavor, try using Primal Palate’s Apple Pie Spice Blend on these instead of just cinnamon. It’s SO GOOD, but I know not everyone has access to that brand, so cinnamon is recommended. I recommend air frying one apple’s worth of chips at a time, unless you have a larger size air fryer. Please note I use a Philips 2.75 qt Viva Air Fryer (affiliate link!). Like most appliances, settings and temperature between models and brands will vary. Nutrition information estimated with My Fitness Pal.